- Writing to Falkenhayn today, Mackensen argues that while the original objectives of the Serbian operation have been accomplished, the campaign remains incomplete as long as the Serbian army has not been destroyed. 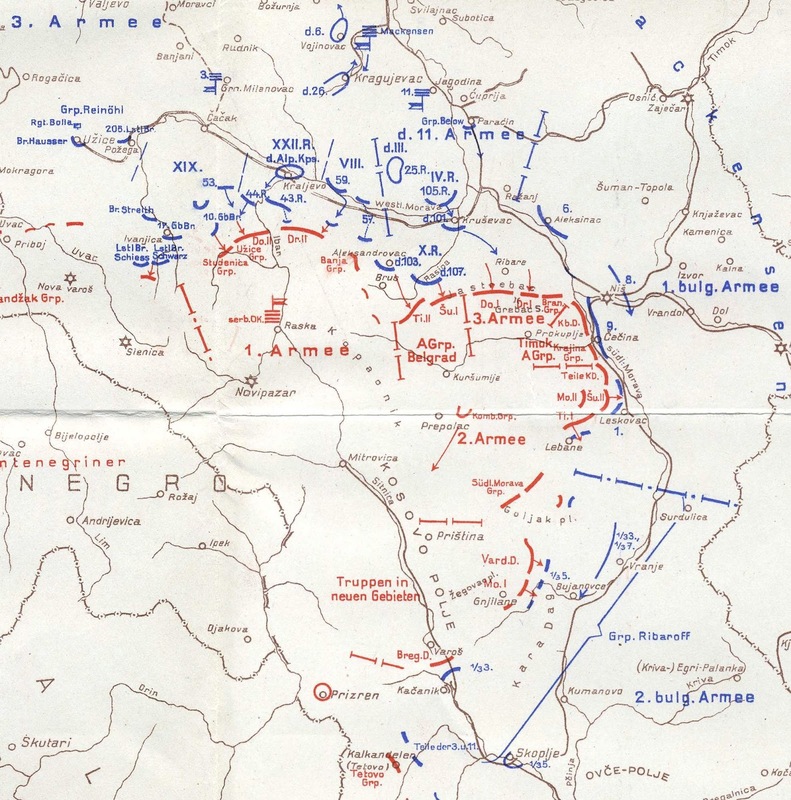 This can be best accomplished, in his view, by a vigorous pursuit by the Austro-Hungarian 3rd Army down the Ibar River valley towards Kosovo while the German 11th and Bulgarian 1st Armies advance towards Priština. Here, it is hoped, the Serbian army can be brought to a final battle, made all the more decisive given the historical and cultural significance of the region to Serbian nationalism and identity. Mackensen's hopes are bouyed by intelligence reports today that the Serbian army has lost over half its strength since the beginning of October. The front lines in Serbia, November 11th, 1915. - On the Italian Front the second day of the latest Italian offensive along the Isonzo River hardly differs from the first. Opposite Görz, the southern wing of the Italian 2nd Army advances between Oslavija and the heights at Podgora, but by the end of the day have only heavy losses to show for their attacks. To the south, the Italian 3rd Army attempts a repeat of the prior day's operations, with a three-hour artillery bombardment preceding infantry assaults at noon. However, a similar effort leads to similar results: most of the attacks break down before even reaching the Austro-Hungarian positions, and in those few cases where the infantry manage to enter the first trench line - mainly near Peteano - counterattacks are able to drive them back out. - The British 6th Indian Division begins its advance towards Baghdad today, over two weeks since General Townshend was ordered to capture the city and more than a month since the victory at the First Battle of Kut-al-Amara. The significant delay has been the result of severe supply shortages resulting from the difficulties in bringing sufficient food, fodder, and munitions forward along the Tigris River from the main base at Basra far to the southeast. Even today 6th Indian Division is hardly well-supplied, as soldiers continue to suffer from a range of illnesses related to poor food.